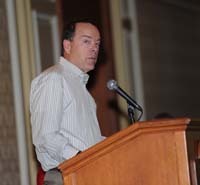 Blaine County residents are overlooking opportunities to invest their money locally, thereby inhibiting the growth of local businesses, an expert on community economics told an audience at the Sustain Blaine Economic Summit conference Tuesday. Michael Shuman, the author of “Local Dollars, Local Sense,” was the keynote speaker at the daylong conference attended by more than 200 people at the Sun Valley Inn. Shuman said part of a solution to that situation is to facilitate local investing. He said federal law requiring stock issues to be registered with the Securities and Exchange Commission—an expensive process—has been amended to exempt trades of up to $2,000. However, he said, the SEC has not yet passed a rule in response to the law. He said the state of Georgia has enacted its own exemption, and Idaho should consider doing the same. - Create cooperative businesses, which can legally borrow money from their members. - Issue municipal bonds to support local food production. He said municipal bonds have been used to fund lots of dumb projects, “so let’s start using this form of low-interest finance for smart stuff.” He said Blaine County produces a lot of beef cattle, but is neglecting opportunities to “plug the food leak” with products that include poultry and pork. - Use “pre-selling” to raise capital. He said people can provide money to a new business in exchange for receiving a greater value in products after the business opens. Shuman said Blaine County government could help by posting a list of local investment opportunities on its website and by taking into consideration the taxation value of local business purchases when it determines the lowest bidder in contract awards. However, in interviews after Shuman’s lecture, several people involved in local lending made statements that cast doubt on Shuman’s contention that lack of access to capital is the main obstacle to business growth in Blaine County. County Commissioner Larry Schoen, chair of the board of directors of Region IV Development Association, a nonprofit corporation based in Twin Falls that provides low-interest loans to businesses, said the organization’s loan opportunities have gone wanting for years. Schoen said Region IV once opened an office in Hailey to make its services more readily available to Blaine County residents, without much success. “Finally they said we’re going home because no one is coming in here,” he said. Schoen speculated that people may have perceived the application process as too complex, but said that is an inaccurate belief. Bryan Furlong, area president of Zions Bank in Ketchum, said his bank has money to make loans, but needs to see strong business plans to do so. “We want to know how we’re going to get repaid,” he said. He said many loan applicants are unable to provide such information. Furlong said that in some cases, the bank is constrained by unnecessary government regulations, and more loans could be made by banks familiar with local businesses if some of those were changed.